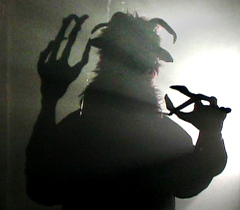 A woman shares a story about a possible encounter with the Goat Man of Texas. “When I was around 8 I was walking home from my school (not supposed to), but I remember walking along the road and a car pulls up. I’m looking and I see it holding a gun on the seat. As I’m looking briefly at the gun, I see goat feet. Hooves and all. This thing had a trench coat and had an abundance of fur.